Rio Grande’s Kinnison Donaldson sends a volley back over the net during a match against Indiana University East last season. Donaldson and her teammates have been picked eighth in the 2018 River States Conference preseason coaches’ poll. 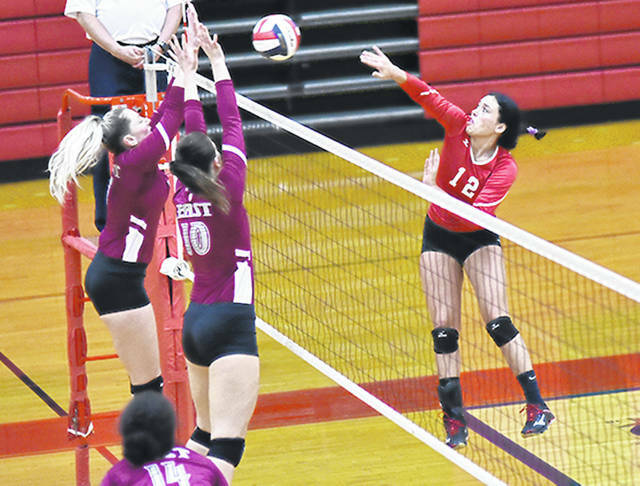 MIDDLETOWN, Ohio — The University of Rio Grande was tabbed eighth in the 2018 River States Conference Volleyball Preseason Coaches’ Poll released Saturday. The RedStorm collected 41 points in the balloting of the league’s head coaches. Head coach Billina Donaldson’s squad is coming off a 5-29 record overall and a 2-14 finish in conference play last season. Rio Grande will open its regular season schedule on August 30 at the University of Pikeville. Indiana University Kokomo is once again the league’s preseason favorite. The Cougars are coming off a 30-10 season and earned nine out of a possible 10 first-place votes in the polling of the coaches. IU Kokomo went a perfect 16-0 in the RSC last year to claim the conference’s regular-season title, and it reached the finals of the RSC Tournament. The Cougars made their third NAIA national tournament appearance in a row with the others being as conference tournament championships in 2015 and 2016. Indiana University East, the 2017 RSC Tournament champs, was picked second this preseason. The Red Wolves posted an overall record of 21-19 and a conference mark of 12-4, winning the RSC East Division and sweeping the tournament bracket on its home court to make a return to the NAIA national tournament with a young roster. Point Park (Pa.) University was next in the poll in third place. The Pioneers were 21-14 overall, 10-6 RSC last year for second place in the RSC East. Asbury (Ky.) University was just one vote behind and fourth overall in the preseason poll. The Eagles, who were RSC Tournament semifinalists last year, are coming off a season of 20-8 overall, 12-4 RSC. IU Southeast placed fifth in the voting. The Grenadiers were 17-20 overall and 11-5 RSC for fourth place in a very tough RSC West Division last year. Brescia (Ky.) University makes it four of the top six teams in the poll being from the RSC West with a sixth-place showing. The Bearcats had a strong season of 22-14, 13-3 RSC a year ago for second place in the division. WVU Tech and University of Rio Grande (Ohio) are projected as the other two playoff teams from the RSC East, and they came in seventh and eighth in the poll. The top four teams from each division make the postseason. Carlow (Pa.) University and Cincinnati Christian University are tied for ninth in the poll, and both of those teams just missed the playoffs last year in fifth place in the RSC East and West, respectively. Ohio Christian University and Midway (Ky.) University rounded out the voting in 11th and 12th place.